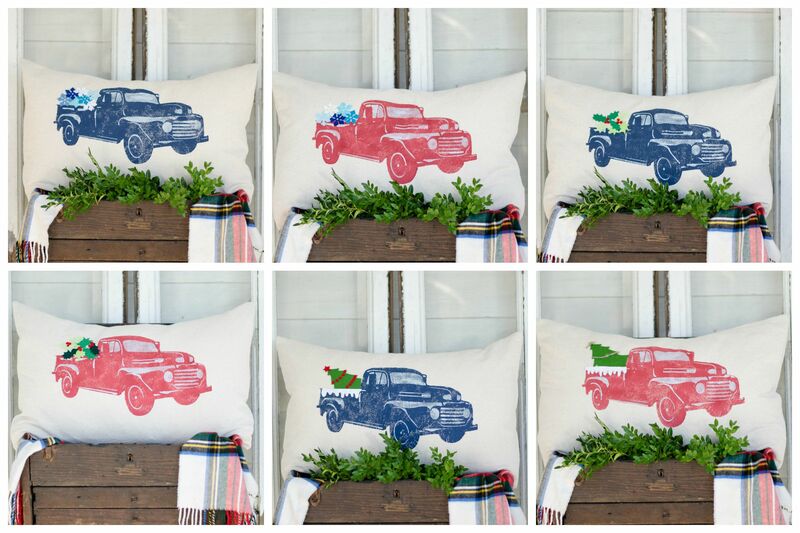 I’ve had a lot of fun creating these Christmas pillows. I have more ideas floating around in my head but I had to take a break from designing and get these finished up and photographed so I could share! 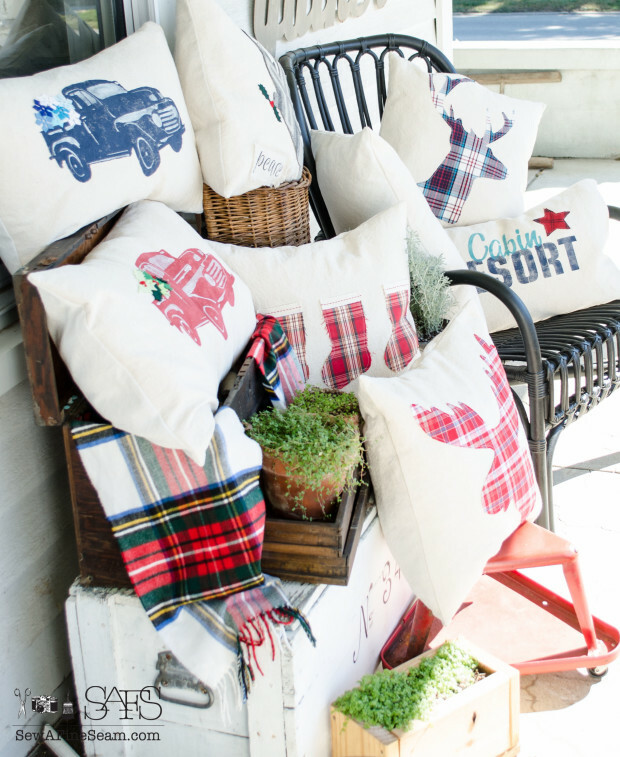 I’m still madly cranking out fall pillows and custom orders too – can hardly get caught up. I’m going to have to put a stop to custom orders that take a stencil for awhile I think. 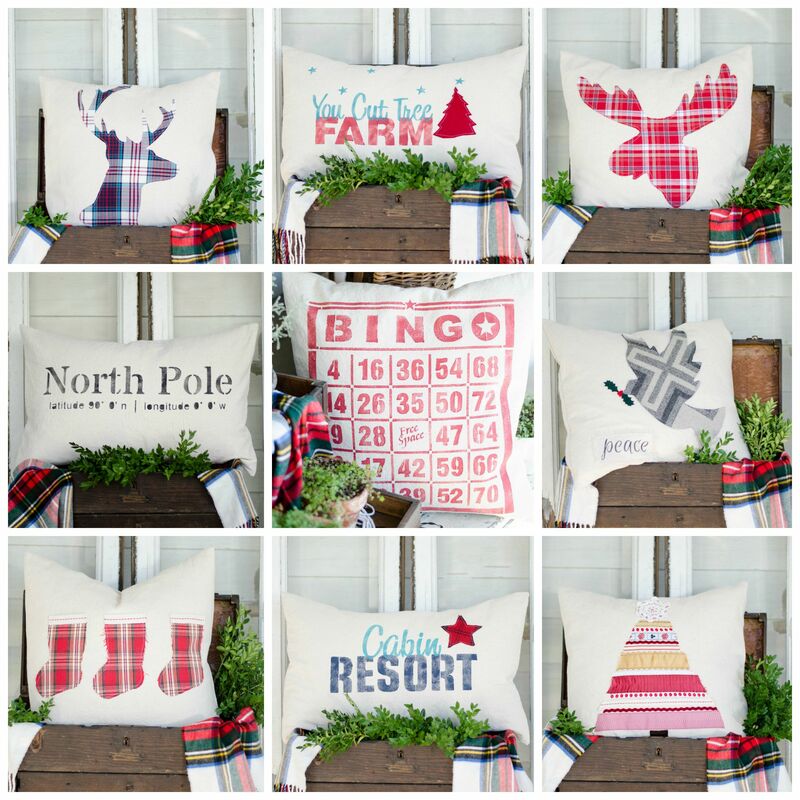 So here you go – 2015 Christmas Pillows available for Wholesale to shop owners. It was rather hot in the sun while shooting this Christmas set-up! It was rather fun creating a Christmas scene outside without freezing 😀 Deer head pillow – using plaid, stripes, leather, and textured wools etc. You Cut Tree Farm pillow with wool felt tree. Moose head is back this year only this time the moose is larger! Plaids, stripes, leather, wools, etc. North Pole latitude/longitude coordinates pillow. 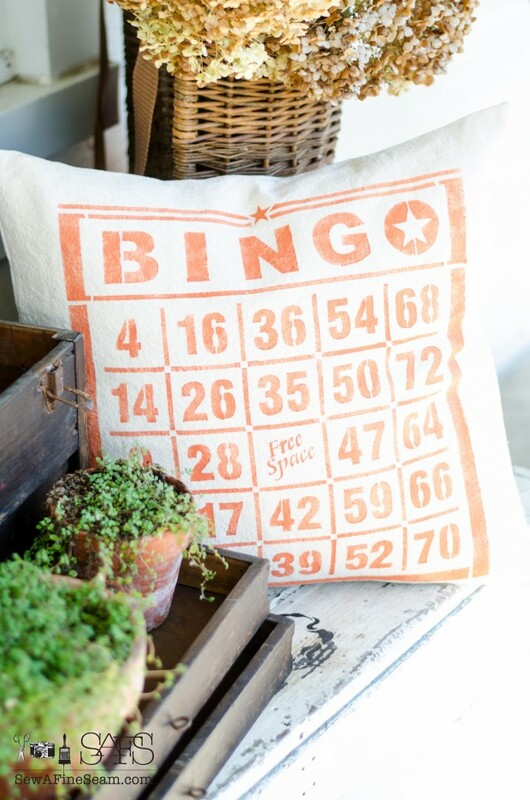 Bingo pillow stenciled in red. New this year the Dove with holly branch is created with various plaids, stripes and textured fabrics. Holly and berries are secured with glue – spot washing recommended. Row of stockings pillow will be made with varying plaids stripes or textures that I have on hand. Cabin Resort pillow with plaid star. Ribbon tree pillows will be made with various ribbons and the star on top will vary. Each one is unique, fun and totally cute! My trucks. I decided to do the blue and red trucks for Christmas and added some fun details to the truck bed. Trees, snowflakes, and holly leaves and berries. Each one is hand detailed and will vary. Spot washing recommended on these. I decided to do a few in plaid for the fall/Christmas season and here they are. Each one will come with white hearts that can be glued on in the location(s) the customer chooses. OR I can sew them on if you have specific spots you know you want them. Joy and Peace. Or any other word you choose. Shown here on two different fabrics, both differing from the canvas fabric I’ve been using. The grey is a lovely wool blend and the tan is a linen-look suiting. 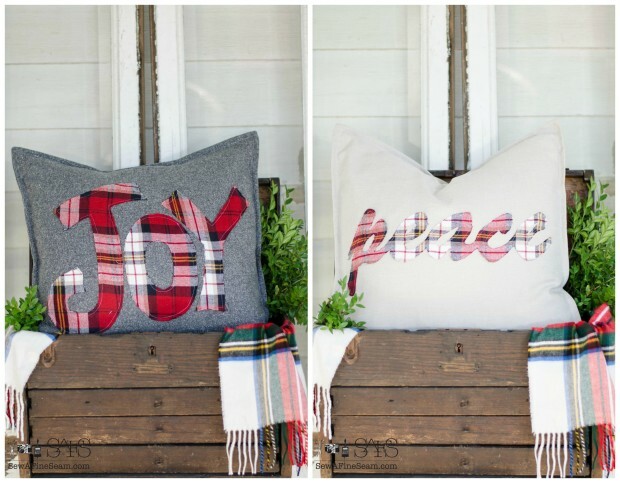 Both are priced a bit higher than the canvas fabric pillows. I also created the Bingo pillow in orange – my sister requested this one! If you have a shop and are interested in purchasing pillows for wholesale you can contact me for pricing and details. I wholesale the covers only and will chat with you via email about the pillow forms these are sized to fit. If you are not a wholesaler I also sell these retail. I have a shop near me where they will be available and I will be adding them to my online shop very soon too. So tell me, which one was YOUR favorite? What designs would YOU like to see Sew a Fine Seam create? 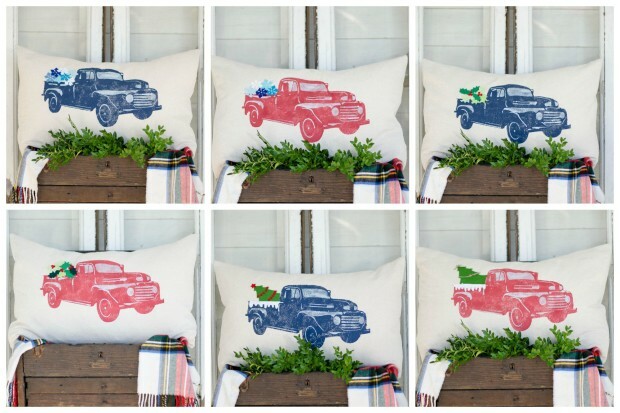 Love all your pillows, I Love most the deer head in blue/purple plaid and the blue truck with decorated tree in back. Also love the moose and Gray felt Joy. How much would all be for pillow covers? Don’t need forms as have plenty to reuse and reuse. Might treat myself to couple new pillow forms. Thanks Becky, honestly homeschooling makes it easier to get all this done I think. My oldest is going to school this year and that schedule really cuts into my time. With homeschool we are here and I can work around all the school work! Thank you so much Bernideen! I had a lot of fun creating them. Carla, did I email you? I can’t remember if I did or not! I meant to and hope I did – let me know if I missed getting that sent! 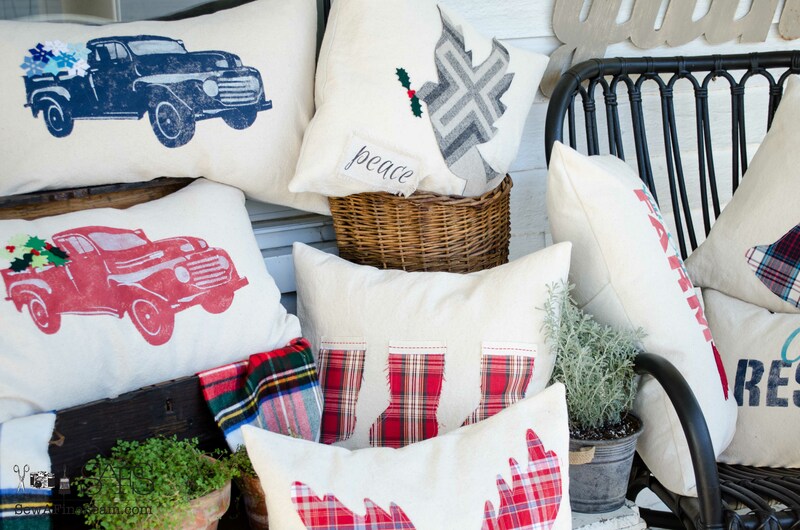 I am interested in purchasing your pillows wholesale. I have a shop called Collective Piece. 328 S Main St Algonquin, IL 60102. Please advise. Hi Jill! Would love to add your beautiful product to our gift shop in our pharmacy in East Tennessee. Can you tell me how to buy wholesale? Thanks so much and God bless you!